Buche de Noël is a traditional French dessert often served at a Christmas dinner. You can find it everywhere during the holiday season. Elaborately designed Yule logs can be found with a hefty price tag in chic patisseries but you can find industrial made ones and frozen ones in the supermarket too. Traditionally made from a Génoise, a light sponge cake covered with chocolate, coffee, or chestnut cream, it is rolled up to resemble a log. The tradition of this log dates back to the Celtic times celebrating the winter solstice, the shortest day of the year. The burning log was a symbol of the rebirth of the sun as well as an offering of thanks for its return. As time passed the tradition of burning logs in large hearths were replaced by smaller burning stoves. With all eyes on the center of activity, the burning log made its way onto the table as a decorative and edible tradition. In a large mixing bowl beat the egg yolk and half of the sugar( 1/4 cup) and then add in the pumpkin purée. In a separate bowl combine the flour, baking soda, cinnamon, and salt. Pour it into the wet mixture in parts and stir. In a mixing bowl, whip up the egg whites until it turns white and forms peaks. Gently fold this into the above mixture until well combined. Line a 15 x 10 inch baking pan with parchment paper and pour the batter across the pan. Smooth it out with a spatula. Bake at 190° Celsius for 12 minutes. The cake should be spongy so that when you press down on it it should spring back. Let it cool for a few minutes. Spread out a kitchen tea towel on a flat working surface and dust it with some confectioner's sugar. Turn the cake onto the towel and line up the ends of the cake and the towel. Carefully peel off the parchment paper and begin to roll up the cake and towel together. Then set it aside to cool completely. Prepare your filling by beating the first three ingredients together until smooth and stir in the lemon zest. Unroll the cake after it has cooled down completely and spread the filling all over it. Roll it up again and sprinkle with confectioner's sugar when ready to serve. It's not Bastille Day, it's le quatorze juillet, la Fête Nationale. I just discovered that Bastille Day is a British term and that's what I always referred to it as when growing up in New York. In New York, there were annual street fairs celebrating Bastille day with French food and wine. Even contests were set up so that one could win a roundtrip airfare to Paris and back. Living in the know and now in France, we simply refer to it as le quatorze juillet and it is formally called la fête nationale. Festivities start with the Fireman's Ball in various fire stations across Paris on the eve, then a morning military parade on the Avenue des Champs Elysées, and closes with an evening fireworks display from the Eiffel Tower. History in a nutshell: Mutinous minds were brewing a few years earlier leading up to the start of the French Revolution which began with the storming of the Bastille prison on July 14, 1789. Living in a feudal aristocratic system with the philosophes of Enlightenment, a weak monarchy, and with escalating food and taxe prices—let's just say that some people were not happy. The Bastille prison symbolized the arbritrary use of power of the French monarchy. It's where upper-class and political prisoners of French society were held, unopen to trial, and only under the king's orders. Thus, attacking it signified the start of a revolution which led towards years of violence and bloodshed—although not so much on that particular day. Excactly one year after the storming of the Bastille, the Fête de la Fédération was inaugurated on July 14, 1790 to celebrate the unity of France, symbolizing peace. July 14th commemorates the storming of the Bastille and the Fête de la Fédération. And if you keep scrolling down to the bottom, I leave you with Serge's scandalous version of La Marseillaise, the French national anthem. Vive la France! Vice la République! Pre-heat your oven to 220° C.
Lay your naked duck breast with skin facing up. Score the skin of the duck in squares without cutting into the flesh. Pop the duck into the over with the skin fat face up for 15 minutes. After 15 minutes, flip the duck over and then lower the temperature to 180°C and let it cook for 10 minutes. Take it out of the over and and cut into slices. Serve it along with some roasted potatoes and garlicky green beans. I'm a pesco-vegetarian with lots of taste testers amongst me. Apparently this gets a thumbs up with my carnivorous family. You can't screw this recipe up, just throw it in the oven! La Chandeleur...the day we must eat crêpe. February 2 marks the halfway point between the winter solstice and the spring equinox making it a cross quarter day and known as La Chandeleur in France. Basically, it's crêpe day in France based on traditions and superstitions. Stemming from both pagan and religious origins, the color and shape of the crêpe symbolizes the sun as days become longer and warmer; while winter wheat is being sowed, leftover flour from the previous harvest is used to make these crêpes in hopes of prosperity for the following harvest. The Christian orgins involve Jesus so I won't get into further detail, just that He is the "light of the world", hence Festival of the Lights (La Chandeleur). I think every French person has earned their rite of passage in crêpe making and they'll be more than happy to tell you what's wrong with yours. You can never pin them down to exact measurements. They just know. I usually have to show my batter to a French friend to make sure I've got the consistency down pat. That's just one hurdle because forming those perfectly round crêpes is another. Then there is the decision making for the filling and the fine art of folding. Finally with a stack of crêpes in front of us and a choice of fillings: jams, fresh sliced fruit, whipped cream, chocolate sauce, salted caramel sauce, lemon halves, granulated sugar, and a bit of Grand Marnier (my husband's preference). My daughter and son, who have eight and six years on me in crêpe tasting, give me articulated critiques after each crêpe we have personally created and devoured together. In a large mixing bowl make a well in the center of the flour. Add a pinch of salt. Add one egg at a time into the well of flour. Whisking each egg in with some flour each time as to avoid clumps. Gradually add in the milk, stirring to combine. Add the oil and continue to stir until it's well integrated. The texture of your batter should be smooth and the consistency should be thin but not too thin (think Half and Half). Let your batter rest for 30 minutes or longer. Lightly coat your crêpe pan or a non-stick pan (I used a 9 1/2 inch or 25 cm pan) with some oil. Holding the pan with one hand and using a ladle with the other, spoon out some batter and pour the batter into the pan while swirling your wrist so that the batter spreads and covers the surface of the whole pan. Slighty brown both sides by flipping the crêpe ounce it turns a soft yellow color with golden speckles or simply use a spatula to turn it over. Depending how large your ladle is you will have to figure out the right amount of batter just enough to thinly spread and cover the surface of your pan. I filled half my ladle for the size of my pan. Go figure, I've had an epiphany to make a King cake on the day of Ephiphany! In France one can find a galette des rois before the first Sunday in the new year comes around. Bakeries are cashing in on this lovely, flaky, delectable dessert in anticipation of Epiphany, on January 6th. I decided to spare some euros this year and make one myself, much motivated by the fact that my then four-year-old son came home with the recipe from his teacher at school. If she can do it with a class of twenty-four four-year-olds, I can certainly manage one with my two kiddies. In the French tradition, a fève (a bean) is placed in the galette des rois. Nowadays it's replaced by tiny figurines of some historical, religious representation or some beautiful collectible designy things. Umm—I think this would be a choking hazard in the U.S.? Anyhow, the fun bit is that the youngest child in the group you are sharing this galette des rois with goes under the table and shouts out the names of whom the pieces of cake should be distributed to. The lucky one who gets the fève in their piece of cake is then king for the day and gets to wear the crown and choose his queen. Otherwise, as my daughter would say— queen for the day and then choosing her king. We made our own crowns to go with this king cake but golden crowns (sort of similar to slimmer versions of the Burger King ones but without its logo) are given along with the cakes that you buy at the bakery and even the ones sold in the supermarket. Here's a fun fact, apparently the Elysée Palace, the official residence of the President of the French Republic is not served a galette des rois with a fève in it due to rules of etiquette. I suppose just in case he doesn't draw the king? Cut each puff pastry to 24 cm ( approx. 9.5 inches) in diameter. Keep them refigerated until ready to use. Otherwise it gets soft and sticky and becomes hard to work with. Total baking time is 1 hour. Starting off at 180°C (350°F) for 20 minutes, then lowering the temperature to 160°C (320°F) and baking for 20 minutes, and then at 145°C (290°) for the remainder of the time. Filling: Cream the butter and the sugar together with a mixer or by hand using a whisk in a medium inox bowl. To do so, mix the butter until it looks whitish in color. Then add the sugar and mix well, working it into a smooth mass. Add one whole egg, mix, and add half the almond flour. Then add the second whole egg. Continue to mix and add the rest of the almond meal. Then put it aside until ready to use. Optional: You can use a pastry bag (piping bag) for your filling using a large round tip. Put it aside until ready to use. Egg Wash: In a small bowl mix one egg yolk and one whole egg together. Add a tablespoon of water and mix. Set aside until ready to use. Take out one of the refigerated puff pastry and and lay it out on a silicone baking sheet or parchment paper. Fill it in with the almond filling either using the pastry bag or just a spoon to spread it out. 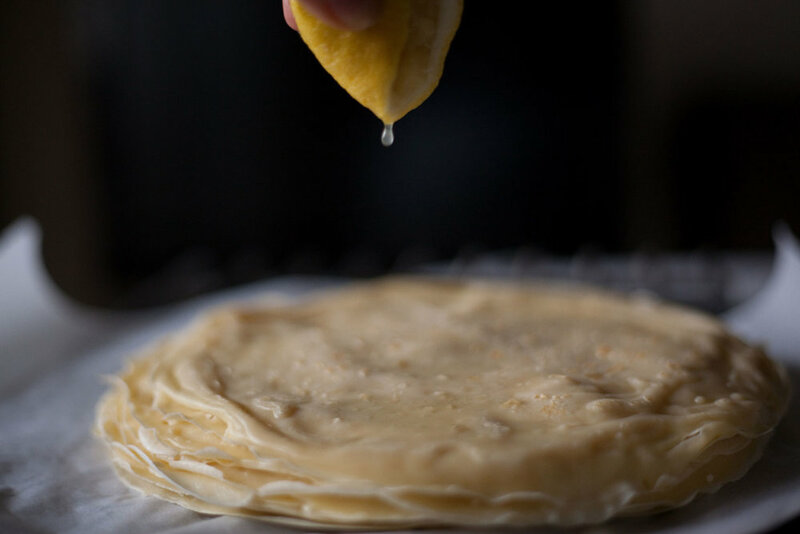 If you are using the pastry bag, hold it up horizontally and squeeze out your filling starting in the center moving in a clockwise direction reaching about 2 cm (approx. 1 inch) before the edge. If you are using a spoon, scoop the filling and spread it evenly around the puff pastry leaving the same 2 cm around the edge. The French use a fève that is placed in the filling near the border. For those who are more safety conscious, you can use a piece of dried fruit in place of the fève. Brush some water along the ring of the filling. Take the second refigerated puff pastry out and place it directly over the filled puff pastry you are working with. Press down, moving around the edge of the filling to seal it. Lift up silicone baking sheet or parchment paper with the pastry on it and flip it over upside down to another baking sheet. Take the sharp tip of a knife, holding it horizontilly, tap into the edges around the pastry. This helps to seal the puff pastry together. Brush a layer of egg wash over the top and then refigerate for 20 minutes. Take it out and then give it a second brushing of egg wash. Then use the tip of a paring knife to carve gently into the puff pastry to decorate. Poke holes using the paring knife all around the top of the pastry avoiding the center before placing in the oven to bake. Remember to start off at 180°C and continue to bake down to 145°C as noted above. Optional: You can glaze your baked cake with maple syrup or chestnut syrup to give it beautiful sheen. This recipe comes from Chef Nicolas Bernardé. You can watch him making it and maybe practice your French at the same time? For my egg wash I added some water to thin it out so that the glaze doesn't have too much of an eggy look on top of my cake. My baking time was only an hour. He states 1 hour 20 minutes. I also didn't put the finishing glaze on my baked king cake since I think the almond filling is sweet enough for my family. It also prevents those potential sticky little fingers from getting all over the place. I've got an English friend. We'll call her "Lady Jo" or "LJ" for short, although it could have been "Trucker Jo." This was her husband's pick-up line when he met her: "Oh, Jo? Like an American trucker Jo?" Yes—and that actually worked. They've been happily together for 20+ years now. Lady Jo is so beautifully British especially with that accent of hers. She can tell anyone to shut up without sounding offensive and she always totes a thermos full of tea tucked away for tea time. She is whom I go to for baking advice because she's got an aunt with creds whom she goes to for baking advice. One day, LJ popped over with this recipe in hand and the gingerbread man cutter in the other. What a delightful surprise for me! Ever since then, I haven't stopped making them. My kids are kept busy individualizing their gingerbread men and I look forward to dunking them in my cuppa. Merry holidays everyone! Sieve the first three ingredients together. Then rub in the butter. Heat the golden syrup in a small pan until runny, add the sugar and stir until it dissolves. Add it to the dry mixture and mix well. Roll into walnut size balls and arrange it on a tray leaving enough space in between each biscuit dough. Bake for 15-20 minutes at 165° depending on size of biscuit. Let it cool and then lift it off the tray with a spatula. Optional: Decorate at your own creative will. I usually roll the dough up in balls much larger than walnut size for the gingerbread man. Depending on the size of your gingerbread man cutter or other shaped cookie cutters you'll have to roll up enough dough so that when you flatten it, it spreads out enough for the cookie cutter to fit. Oven time varies for size and thickness of your cookies. I used a 4 1/2 inch length gingerbread man cutter and rolled it out about 1/4 inch thick. I left it in the oven for 15 minutes. These are the hard, crunchy English style biscuits.